That’s what he said I must be when, last night, I cast on for the BMFA Sock Club ‘Monsoon’ Socks almost as soon as I’d finished the Amber Monkey socks. I delayed only to cook/serve/eat dinner and wind the Monsoon skein into balls. He said it again this morning, when I abandoned my book for the socks as soon as I’d eaten breakfast. But look, they’re so interesting! I hadn’t tried garterstitch toes and heels, I’ve never ever done a crochet provisional cast-on before. And the yarn is delightful, soft and bouncy. Pattern: ‘Monkey‘, free from knitty. Yarn: ‘Seat by the fire’ from A Piece of Beauty. 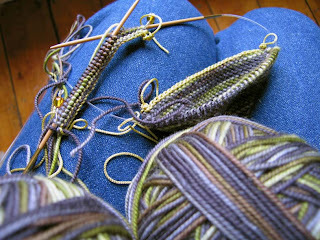 Modifications: Knitted both at once on two circs rather than DPNs; leg/instep on 2.5mm, heelflap, sole, toes on 2mm. I tried to adapt the pattern for toe-up, but I don’t think it’s possible (there’s an earlier post about this). 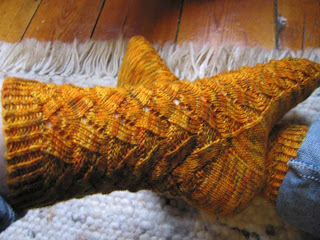 If I knit them again, I’ll try for one more pattern repeat on the leg. The toe is reduced from 32/needle to 14st/needle, then grafted; it works, but the end result seems very square albeit I haven’t noticed a difference in fit. If I do this type of toe again I might try to remember to start a row or two earlier and do the same shaping I do for toe-up. He said he couldn’t believe I’d be willing to wear these socks. I asked why (somewhat belligerently), expecting a comment about the colour (M absolutely HATES it), but he said they appeared far too complex and valuable to be exposed to wear. Strange; I think this is a straightforward, easily memorised pattern. If you’re cold, put on socks. That’s what they’re for. This entry was posted in Uncategorized on April 10, 2007 by sarahw. the monkeys look great!!! we are obsessed are we not? and only the better for it. there are no calories, hangover, accidents while driving intoxicated, etc- AND one gets lovely things to wear… if one must be an “obsessed” kind- this is the best. I love your tangled feet shot. its so cute. Damn, I thought I’d out-grown cute 🙂I know two people who are trying to switch from nicotine to knitting: each time they crave a smoke, they’re pulling out a sock/scarf/whatever. Safer, cheaper, and creating rather than destroying. Love the sock feet! I’m all for the obsession, it’s got to be good for you, right? So, are those Amber Monkey socks comfortable in shoes? They look so textured and dimensionally chunky…Thanks for your consoling email on my blog. I’ve got really mixed feelings about the copyright stuff, it feels like someone is stealing my belongings! Yet, I think it’s an unavoidable part of knitwear design. On the good side, I sold another pattern this AM, so not everyone is just copying! Your fish plate present keeps getting compliments. I just love it…and I’m beginning some swatching with the sea silk. Some day…it will be gorgeous. So happy for you that your DH is home again. 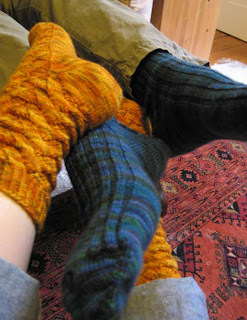 Your socks look wonderful and as the others have said, it’s wonderful to have a creative addiction! The socks look great. The colour is wonderful!….. and obsessed is good where knitting is involved!